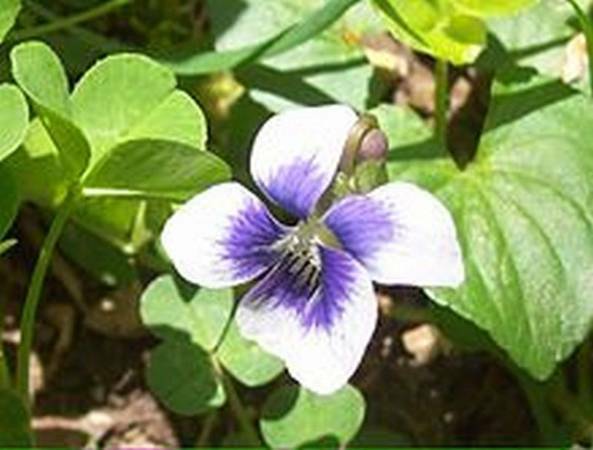 The wood violet is a very small plant and can be overlooked when growing alone. When in mass, they can almost look like ground cover and can be considered invasive weeds unless highlighted and officially shown here as the state flower of Rhode Island. Beautiful, little wood violets come up randomly in my flower beds. They were planted about five years ago after my sister sent me a one-gallon flower pot filled with them. She had dug them up close to our mother's gravesite where they were growing wild. When I received them, I planted some in several flower beds. I now have them in many places. They are wonderful because they bloom earlier in the year than any of my other plants. They start blooming in late January and bloom into March if the weather isn't too warm. They are beautiful in a tiny vase and can fill a room with a delightful, light fragrance. These little gems apparently grow in many northern as well as southern states. They also grow in Louisiana and now in Texas - and likely other states as well. However, there are many references to them growing in European countries. So, who can claim them as their native plants? According to one reference, Zeus was smitten by his wife's priestess, Io. Fearing his wife Hera's anger, he turned Io into a white heifer to protect her from his wife. As a cow, she wept because she had to eat the coarse grasses. To compensate her for her suffering, Zeus changed her tears into the fragrant, fragile wood violet for her to eat. The battle between husband and wife didn't stop there, but that is the reference to the beautiful, dainty violet. 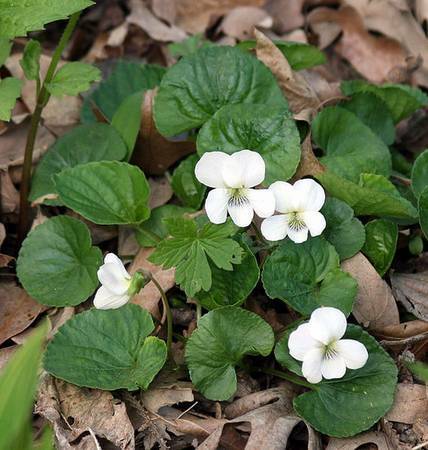 Wood violets were said to be a favorite of Napoleon's first wife, Josephine de Beauharnais, and after her death in the early 1800s, Napoleon was found to be wearing a locket with wood violets he had taken from Josephine's grave. 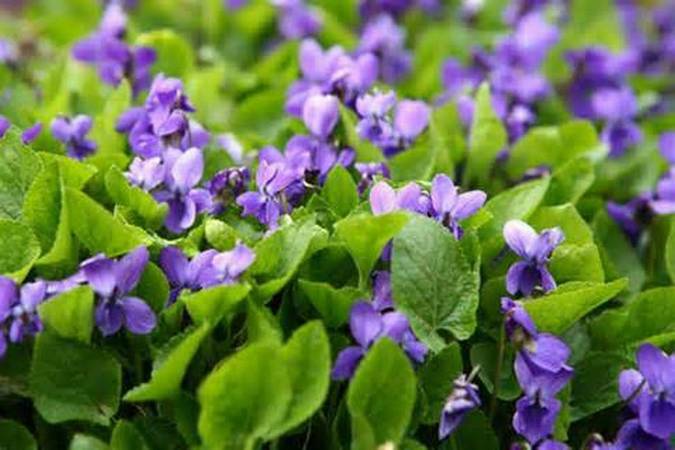 Violets were treasured during the late Victorian period and have been used in the production of many fragrances and perfumes. They have been known to have medicinal uses, and apparently are also used as a flavoring ingredient. The common blue wood violet is a very small plant and can be easily overlooked. It is upright and is a perennial if left out in the woods. However, the cultivated ones usually die back during the summer. The leaves are dark green and rather heart-shaped. The plant may grow up to 6 inches tall and spread up to ten inches, but often are much smaller. They are very easily hidden in the landscape. The bloom can be either purple or lavender and some white with purple in the center. Every so often, a brilliant white will show up although they are more often native to Europe. The fragrance is ever so elusive but wonderful and light. When I have a lot of them blooming, my back yard smells like a violet bouquet. My wood violets very readily reseed. I find them all over my yard, sometimes in between cracks in the cement. I have found them growing in the grass as well. Some people find them invasive and consider them a weed in lawns and gardens. The seeds just scatter when the plant completes its bloom cycle. I have never been able to get the seeds before they do scatter. After the bloom matures and dries, a little capsule forms and this is the seed pod. When it dries, the seeds pop out with the wind carrying them elsewhere. Violets seem to like the conditions in my garden. I have a lot of organic matter in my flower beds. They do like to stay cool, so they typically grow in more shaded areas. I also have them in areas with more sun. They get the same nutrition I give the other plants and seem to thrive. I am never too sure where they might pop up. Even when they are not blooming, the little plant that is covered with bright green, heart-shaped leaves is beautiful. They are not prolific bloomers, and I think that is what makes the colorful, little flowers so special. • Watch for more information. 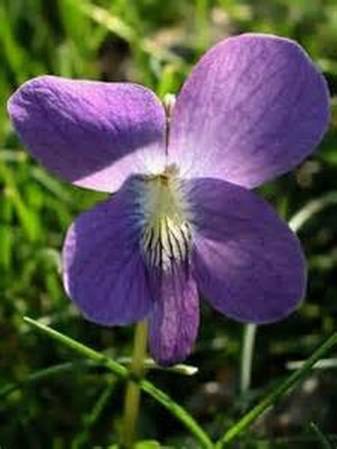 • There are 400-500 species of violet (viola) distributed around the world, most in the temperate northern hemisphere. • The incentive for adopting state flowers was inspired during the 1893 World's Fair in Chicago. The common blue wood violet is the state flower of Illinois, New Jersey, Wisconsin and Rhode Island. • Illinois was the first to adopt it by school children selecting it in 1908. Rhode Island was the last state to adopt an official state flower. Although selected by Rhode Island's school children in 1897, the flower was not officially adopted as the state flower until 1968.